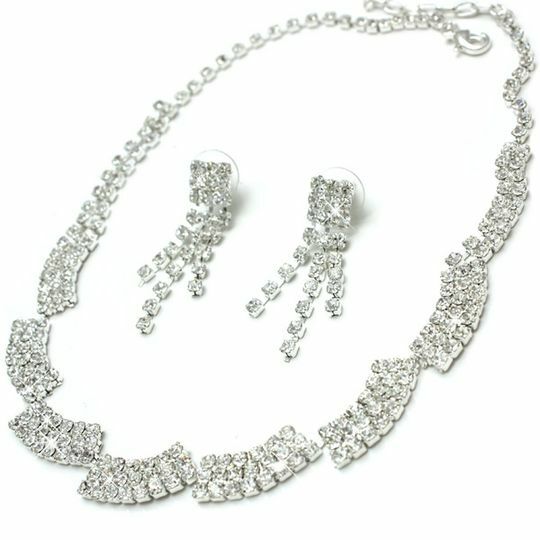 Using fine Austrian crystals this classically styled jewellery set has a staggered design on Silver that is simply packed with crystal stones in its entirety! The matching earrings in themselves are showcase pieces with fountain drops to add glitz and glamour on that special occasion! Necklace length adjustable from approx 42cm upto 49cm with extender and lobster clasp. Staggered crystal pieces measure 2.5cm for a dramatic impact. Post finder pierce earrings with a 4.5cm drop.